I have enough articles here to share that tells the story. In the last six games (three against the Colorado Rockies and three against the San Francisco Giants), the Yankees' opponents have stolen a lot of bases (four on Sunday alone), while the Yankee bullpen has been overworked and unable to keep the team in the game. I remember the sign that the 2001 Red Sox were finished. It was August 25th in Arlington, Texas. The Red Sox lost to the Rangers, 8-7, in 18 innings. The game ended after 3am, Eastern Time. Just look at that box score. The late Rod Beck pitched three hitless innings in that game. He was followed by Derek Lowe in the 18th, but a throwing error by shortstop Mike Lansing allowed a base runner to reach first safely, and he wound up becoming the unearned run that won it for Texas. It was a heartbreaker of a game. And you just knew that Boston would not be able to catch-up with the Yankees, where were just 3 games ahead in the loss column, and on their way to a forth straight World Series appearance. As August became September, the Red Sox slipped to as many as 16 games behind the Yankees, and the clubhouse imploded as new ownership took-over the team. Dan Shaughnessy foolishly argued that through their temper tantrums and disorder, the Red Sox were setting a bad example to the nation in the wake of 9/11. Whatever, Dan. The Sox collapse that season began well before the terrorist attacks. They were eight games behind New York on September 1st. The free-fall was already in-progress, and Carl Everett was already causing havoc in the clubhouse. And the night the sox fell, was an 18-inning all-nighter in hot and humid Arlington, Texas. You watch the games and can’t help but feel the Yankees’ run of nine straight AL East titles is finished. 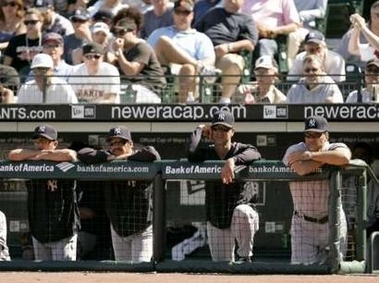 What happened to that nine-game winning streak that injected life into the pinstripes?....This is a bad team. Can it only be a week ago that they seemed firmly in contention? After a 1-5 start to their nine-game road trip that continues tomorrow in Baltimore, the Yankees are reeling again, have fallen under .500 at 36-37 and may have wasted a stretch in which all seemed right. The real sign that we had passed into an area of peril was the sight in the seventh inning of Roger Clemens pitching in relief. I'm going to keep a tab on the game the Yankees played on Saturday (June 23rd). That might have been the day it finally all went to hell for the 2007 Yanks.